Gottfried Wilhelm Leibniz was one of the central figures of seventeenth-century philosophy, and a huge intellectual figure in his age. 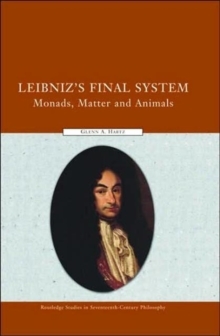 This book from Glenn A. Hartz (editor of the influential Leibniz Review) is an advanced study of Leibniz's metaphysics. Hartz analyzes a very complicated topic, widely discussed in contemporary commentaries on Leibniz, namely the question of whether Leibniz was a metaphysical idealist, realist, or whether he tried to reconcile both trends in his mature philosophy. Because Leibniz is notoriously unclear about this, much has been written on the subject. In recent years, the debate has centered on whether it is possible to maintain compatibility between the two trends. In this controversial book, Hartz demonstrates that it is not possible to maintain compatibility of idealist and realist views - they must be understood as completely separate theories. As the first major work on realism in Leibniz's metaphysics, this key text will interest international Leibniz scholars, as well as students at the graduate level.